In the morning, you can be either picked up at select hotels/locations in Tokyo or meet your guide at the designated location in the central Shinjuku. Start your tour by visiting the Meiji Jingu Shrine, the biggest shrine in Tokyo (approx. 40 minutes) and the Imperial Palace East Garden (approx. 40 minutes). If the East Garden is closed, you'll explore the Imperial Palace Outer Garden and the Niju-bashi bridge. Also you'll be able to see some symbolic Tokyo landmarks on route such as National Diet Building on the way to there. Later go to Asakusa, one of the most popular sightseeing spots in Tokyo (approx. 45 to 60 minutes) and then go to the Ryogoku Area, where is known for the sumo culture, for lunch. If you select lunch option, enjoy Japanese chanko hot pot lunch that is known as a special dish for sumo wrestlers. 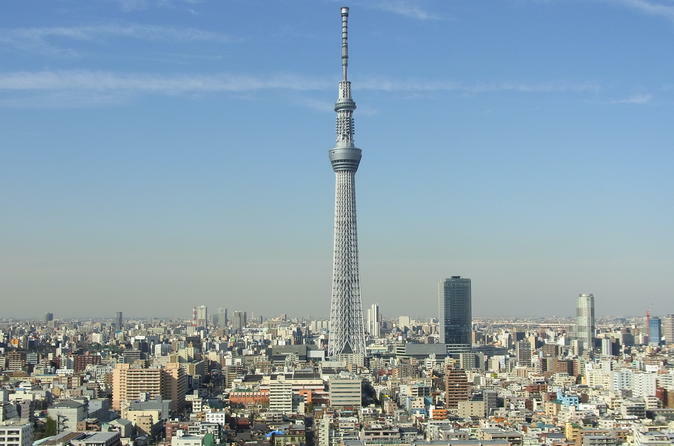 After lunch visit the Tokyo Sky Tree and enjoy the mesmerizing view of Tokyo from the first observation desk. Also you can enjoy shopping in Soramachi. At last, take the Tokyo River & Bay Cruise with good views. After the tour, you can choose to be dropped off at either Tokyo Station or Shinjuku Station.